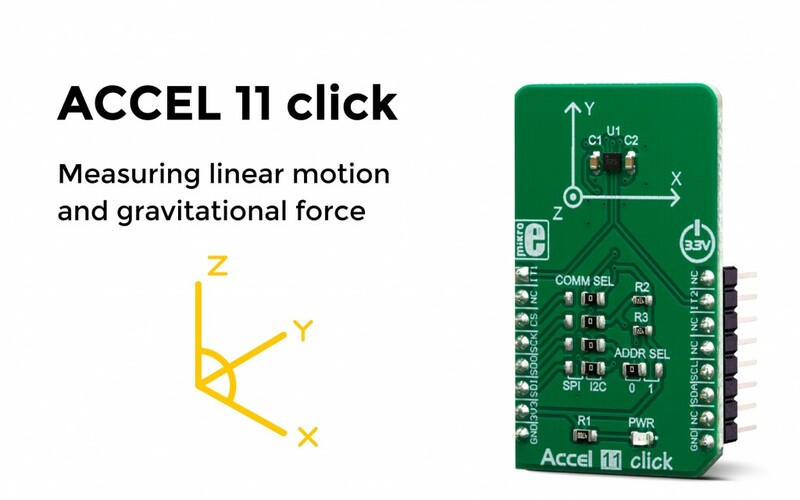 The Accel 11 click features an ultra-low power triaxial accelerometer sensor with embedded intelligence, labeled as the BMA456. This Click board™ allows linear motion and gravitational force measurements in ranges of ±2 g, ±4 g, ±8, and ±16 g in three perpendicular axes. This smart sensor allows the Accel 11 click to detect many different events, including tap, double tap, step counting, activity recognition (walk, run, stand-still), activity change (any type of acceleration pattern change), orientation, and more. It features an onboard data processing, offering the acceleration data directly, over the standard I2C or SPI interface. With the total height of 1.10mm, the BMA456 is well suited for using it in wearable and handheld devices. Its powerful event detection engine is equipped with a set of features suitable for a wearable device, including step detection and count, walking activity recognition, tilt on a wrist, tap/double tap detection, and any motion pattern detection. The sensor can use any of its two interrupt pins to report a detected event. For more information about the Accel 11 click, please visit our website.